Any fast food restaurant, road side carts, chowpatty beach, in India will have a variety of machurian to offer to its patrons. I remember the supermarket, Multiplex, opposite Nami’s college would set up a small stall every evening just outside its entrance and make all sorts of machurian dishes right from mushroom, paneer to chicken machurian. They made the yummiest machurian. You can have it as a meal on its own or even eat it with some rice or noodles. Many people in India have it as a starter with or without beer. A few days ago,I felt like having machurian so decided to try out the baby corn one. No one serves good machurian in Mombasa. Turned out pretty good, but it could have been better with a little bit more chillis. As I mentioned above, its a chinese indian fusion. As you may have noticed, green pepper and spring onions are missing from my photo. I didn’t get any spring onions and Ajay is allergic to sweet peppers. As I got only 1 packet of baby corn, I couldn’t cook both, one with and one without green pepper. Its pretty hot in Mombasa and looking for fresh vegetables at the moment is a task. Wash the baby corn and cut it into half. Put some water to boil and add a tsp of salt to it. When it begins to boil, add the corn.Cook for 3 minutes or till its just done. Drain out the water and keep the corn on the side to cool. Heat the oil for frying in a wok, frying pan or karai over medium heat. In the meantime get the batter ready by mixing the batter ingredients. 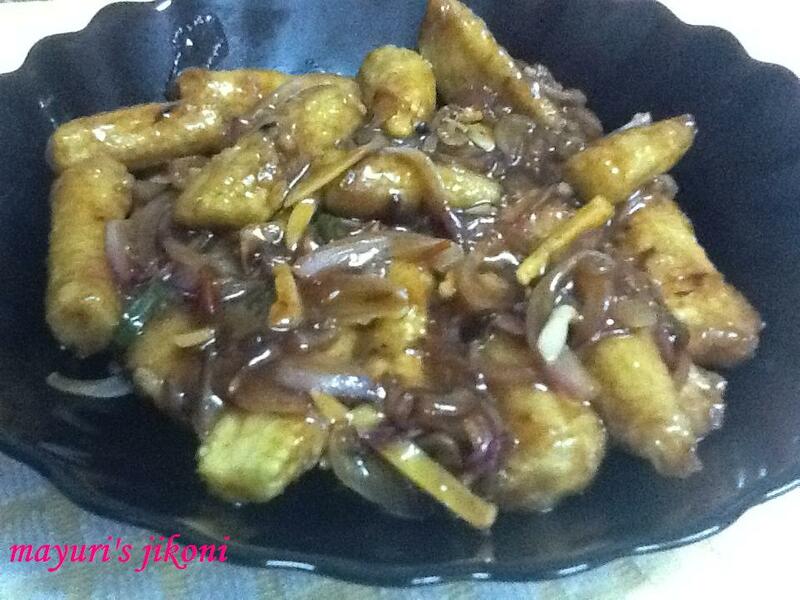 When the oil is hot, dip the baby corn pieces in the batter and fry them. Fry them till they become golden brown. Remove and place them in a colander or on a kitchen paper to remove the excess oil. Heat 2 tbsp of oil in a wide pan. When it becomes hot, add onion and pepper and stir fry for 1 minute over high heat. Add ginger, garlic and chillis. Stir fry further for a minute or so. Mix water, soy sauce,vinegar, chilli sauce, salt, sugar and cornflour in a small container. Add fried baby corn and pepper powder to the onion mixture. Mix well. Add the soy sauce mixture and quickly mix the vegetables. Garnish with chopped spring onion and serve immediately. Use good vinegar like cider, wine or rice vinegar. If you use vinegar substitute you will get a very sharp acidic taste. The same method can be used to make cauliflower, mushroom and paneer machurian. If you are using cauliflower, cook it in salted boiling water for 2 minutes. Keep the fried corn, or whatever you are using,ready ahead. Just before serving, stir fry it. I used my home made chilli sauce. You can use any.